Edelweiss Cruises offers 3 unique vessels for wedding ceremonies and receptions-Lakeside Spirit, Miss Wisconsin, and Harbor Lady. Impress your guests with a cruise aboard any one of our vessels by showcasing downtown Milwaukee and the shoreline of Lake Michigan! Breathtaking views and first-class accommodations make Edelweiss Cruises an easy choice for weddings. Having the ceremony and reception all in one location is a convenient choice for couples and guests. Ceremonies that are held on board require the same layout and floor plan as the reception. Capacity for ceremonies is lower than the overall capacity of each boat. Our Special Events Coordinator can help decide what boat will best fit your needs. Basic ivory table linens and linen napkins are included in the price of your event. Colored linens, napkins, chair covers, and accent pieces are available for additional costs and enhance your event tremendously. Standard banquet chairs with either maroon or navy blue seats (chair color is specific to each boat and not optional) and rectangular tables are included with the price of your event. Small bud vases (4 inches high) with fresh flowers are included in the price of each event. If you prefer to provide your own flowers, decorations, or centerpieces - they can be dropped off to our events office the day prior to the event and in most cases can be set up by our service staff. This also includes card boxes, guest books, and picture frames. Specific drop off times must be arranged with our Special Events Coordinator in advance. All decorations must be removed from the boat immediately following your event. DJ’s and live bands are allowed on board for private events. You must notify your Special Events Coordinator if you have hired a DJ or band so that setup times and loading locations can be arranged. Milwaukee River Cruise Line has relationships with musicians and DJ’s throughout the Milwaukee area that can be added to your event contract for an additional fee. Please note that DJ’s and live bands also limit the boat capacity and affect the floor plan. Our vessels are also equipped with CD players and iPod hookups to play your own music and playlists through our sound system. 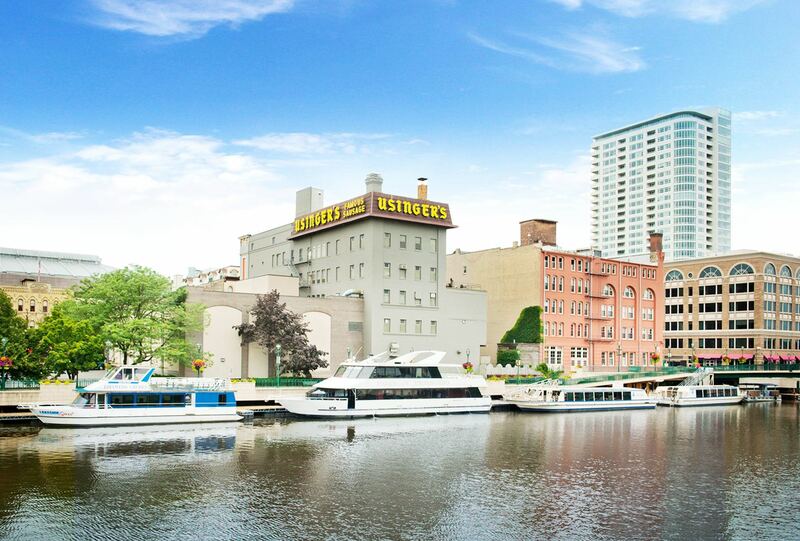 Milwaukee River Cruise Line works directly with Pier 106 Seafood Tavern to provide you with a variety of outstanding menus resulting in quality presentations and service. Impress clients and out of town guests with the stunning views that only the Edelweiss can provide by traveling through the heart of downtown and into Lake Michigan. Buffet style menus are a great option for your wedding rehearsal or dinner because they create a friendly, social atmosphere for your guests. Edelweiss offers both drink packages (prices based per person) or Hosted/Cash prices (per drink) for your cruising enjoyment.